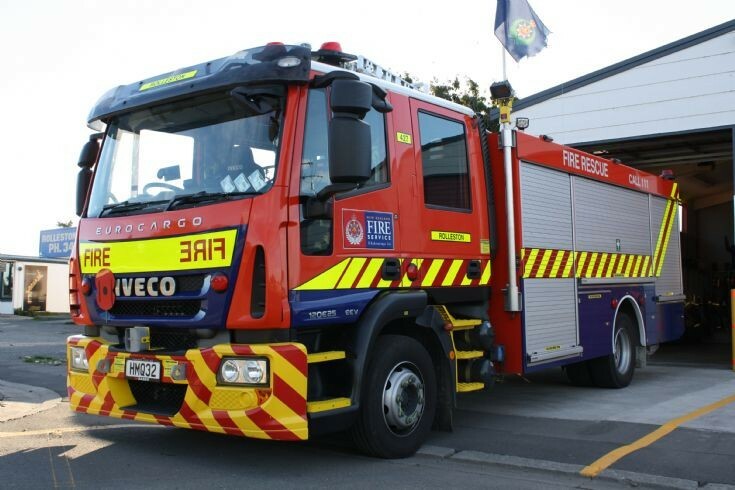 Delivered in 2014, this Iveco ML120EC25 is a pump rescue tender based with the Rolleston volunteer fire brigade. It was photographed in April 2016. 83% of New Zealand firefighters are unpaid volunteers, operating 360 of the country's fire stations. Most of these stations - one for every 7, 000 citizens - are equipped with either one or two appliances. Almost all have a rescue pump similar to this example. There are 79 full time stations in larger towns and cities, and these house the vast majority of specialized units as well of course as their own pumps. The total fleet includes around 850 various fire and rescue appliances and 330 support vehicles. Combined, they attend around 80, 000 calls a year, with the volunteers handling between 20% and 30% of all incidents. Yet another example for the UK of how to provide excellent fire cover without breaking the bank! Added by Rob Johnson on 18 March 2019. Rob, To provide two pumps for every area with a population of 7000 in the UK would break the bank. Not even our city areas have that level of fire cover. For example Cardiff, population over 300 000 is protected by five pumps. And volunteer fire cover is not free. Business as a whole loses out when employees are required to leave their employment to crew a fire appliance. Volunteers have thier place, but they are not the answer to a complex situation. Added by Andy Fish on 28 March 2019. They are the solution in almost every other country in the World, tailored to local conditions of course - and taking into account population density, fire risk profiles and the like. Most other countries have between 55% and (in Germany) 96% volunteers among operational firefighters. Chile is 100% unpaid volunteer, including the capital with over five million population. Many countries do in fact have a volunteer fire station for every 7000 people, including Germany, Austria and Spain. In France, it is closer to 12, 000. When over 70% of British fire services' annual budget is spent on payroll, selective recruitment of unpaid volunteers would relieve the cost pressure they are under. In many countries, even major cities like New York, Tokyo and Berlin rely in part on unpaid volunteers, so their usefulness is not limited to small towns or rural areas. Scotland has volunteers at remote rural locations, but my point is that the access to fire protection, the number of fire stations, amount of equipment and numbers of motivated and trained responders has been demonstrated in almost every country in the World to be cost effective only when a decent number of firefighters are unpaid volunteers. This is not an opinion. it is a carefully researched fact. Added by Rob Johnson on 28 March 2019. Rob, I am well aware that many countries operate very successful volunteer fire depts. in both rural and urban environment's, and credit to those who serve these depts. However for what ever reason you wish to choose it will never happen in the UK. There is already a massive problem here with the recruitment and retention of retained duty system firefighters who are paid. Having worked both the wholetime and the RDS system I can say that the demands and commitment required to be displayed by RDS firefighters is massive. Using myself as an example I was providing 42 hours a week as a wholetime Watch Commander and a further 63 hours a week as a RDS Watch Commander. To ask anyone to work a full time job and then provide between 40 and 80 hours a week unpaid is asking a great deal. Added by Andy Fish on 29 March 2019. Some of my sources seem to think that the main obstacle to having more volunteers in the UK may be the Fire Brigade Union, who have apparently been very instrumental in resisting efforts to encourage volunteers. I personally think it is only a matter of time; the enormous cost pressures on CFOs seem to be just getting more and more draconian - and there really is no other solution. A few German towns still have compulsory unpaid on-call firefighters, and of course here in the US we have a lot of convict fire crews for forest firefighting, but I don't think either of these ideas would go down well in the UK! One very common approach here - which could work in the UK if the FBU would go along with it - is to require off duty full time firefighters to respond on call to reinforce the duty watch as and when needed. This does not improve initial response coverage, but it does help the situation on those relatively rare occasions when a major incident occurs, or when multiple incidents occur at the same time. FDNY did this on 9/11 - but has since completely redesigned the recall response process, because on that occasion it was terribly disorganized and not very effective. Many other US cities have a well developed recall protocol, and a large number of reserve appliances which are ready to roll if needed. They do require their members to live in the community, but this a fairly common precondition for employment in most city jobs anyway. are both protected by firefighting organizations which are mainly unpaid volunteers - and I don't think that in the days of the AFS their members in the UK were paid. Among other things, the numbers of people who are needed is not large. A typical New Zealand volunteer fire station has around 23 volunteers - not a huge number in a community with 7, 000 citizens! And they only attend about one call a week on average. When a fire service like Greater Manchester protects 2.6 million citizens with 40 pumps and three aerials, and London sends four pumps and twenty firefighters to the Grenfell Tower high rise residential building in the middle of the night - with no aerial, rescue or senior officer - it becomes clear that the cutbacks have already gone way too far - and they are not over yet! Added by Rob Johnson on 03 April 2019. Rob, I do not know where you obtained your information about the Fire Brigades Union being anti volunteer or anti retained (as the case may be here in the UK) but I can tell you, as a member of the FBU, that you are way off the mark. Given that we have no volunteer system to talk of here there are only two trade union organisations that represent the retained service, the FBU and the Retained Firefighters Union (RFU). Only the FBU has negotiating rights as a recognised trade union so every settlement achieved by the FBU is enjoyed by retained members, even those who shun the FBU in preference for the powerless RFU. It was the FBU that successfully challenged the UK Government to achieve pension rights for retained firefighters so how it can be claimed that the FBU is anti anything but wholetime is complete rubbish. As for your suggestion of “required” automatic recall to duty then I suggest that the next time you are in Wal Mart you tell the staff that you feel that they should be “required” to report to work at the drop of a hat as and when required and see what response you get. More seriously, the FBU did at one point have a no overtime ban that it imposed, as it was against the idea of firefighters who had completed their required hours and who were recovering from such to place others at risk by working when tired. I know your background is in the truck industry and therefore you will be well aware of UK truck driver working hours for exactly the same reason. Given your obvious interest in the fire service and the fact that you have spent at least some time living in the USA in areas protected by volunteer fire depts can I respectfully ask you why you never signed up as a volunteer yourself? If there was some form of medical reason or other contraint etc than I retract that statement but excuse my curiosity. Added by Andy Fish on 09 April 2019. My local department had a standard for attendance response rates for all of its its volunteers, which I could not sustain. My job at that time involved a great deal of travel both within the US and to numerous overseas countries for often quite extended periods of time. I had 56 operating business locations across the US alone, as well as operations in fourteen foreign countries. When home, I commuted into New York City, so I knew from the outset that I could not sustain the required attendance record. I did however have numerous friends in the fire service, and went to eleven of my friends' memorial services after 9/11. While answering your question, I would point out that I am not suggesting Britain should adopt any particular foreign practice - merely reporting on how others solve the same problems. When the Bain report was published - giving the green light for dramatic cuts in the UK fire service, and setting the stage for what will certainly be more cuts to come - the authors did no research into how any other country anywhere might be providing better fire coverage at less cost. In this day and age, when companies and organizations routinely look everywhere for creative solutions and best practices, it is very sad that all Bain could come up with was "less of the same".